*It's a monster - not a hazard! Awesome. I had forgotten about those ads. I still have a bunch of the comic books where those were found somewhere around Villa Sham. 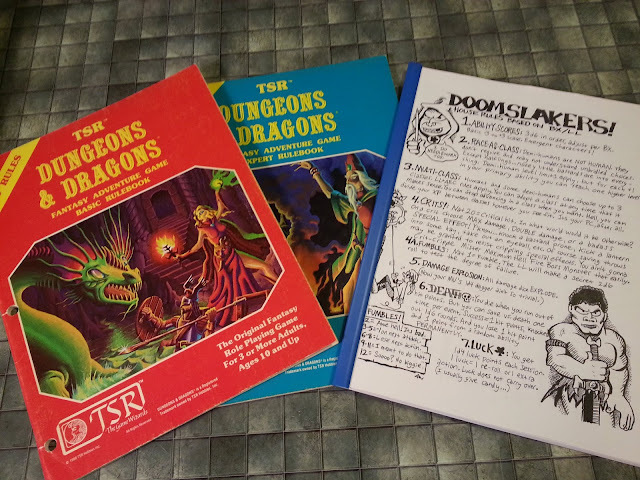 The presumed purpose of these ads--to intrigue young readers with the potential and possibilities of the D&D game--worked on my 13-year-old self like a charm. 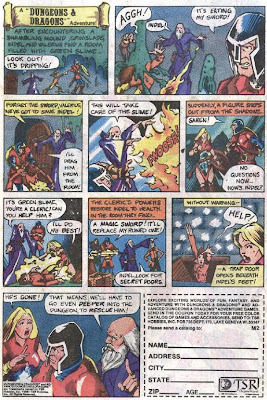 And the later ads, drawn by Bill Willingham, had great visual continuity with Moldvay B/X, I thought. Yea, I remember those. I even sent away the coupon and was excited to receive the catalog in the mail. I think one of the main reasons I love this series (aside from the brilliant decision to use Willingham's wonderful talents, giving the ads a nice visual fusion with the game) is that it really shows, IMHO, what the game is all about. There was a lot of genre media floating around back in the day, but precious little of it reflected the concept of a troupe of multi-racial professional adventurers embarking on expeditions into monster- and trap-filled underground and wilderness environs. 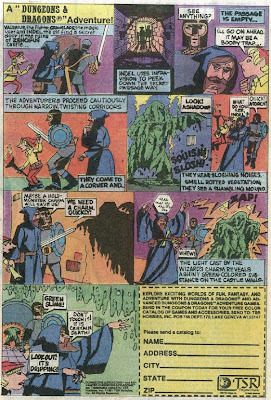 These ads were the only things I recall from that period that spoke directly to me as a D&D player. Funny how Grimslade got so much cooler looking in episode 2. Maybe the Shambling Mound leveled him up? I also like how listlessly deflated Valerius looks about his sword being consumed: "Aww...ain't that the always the way..."